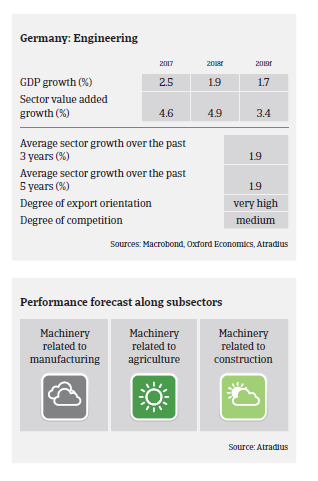 The machines/engineering sector remains one of the main drivers of the German economy, accounting for 3% of GDP. Annual production is forecast to grow about 5% in 2018, according to the German engineering association VDMA. German machinery exports increased 4.3% year-on-year in H1 of 2018, with China and the USA being the largest export destinations. Due to its high export ratio of more than 72%, the industry is highly susceptible to certain risks (deterioration of the global economy, rising geopolitical risks, exchange rate volatility and rising protectionism). According to VDMA, increased uncertainty around Brexit and international trade disputes will slow down machinery production growth in 2019, to 2%. The industry is characterised by high investment (IT and equipment) and increased labour costs. The equity ratios of machinery businesses are higher than the average of the German industrial sector overall, as necessary investments can often be financed internally (cash flow, shareholder and/or mezzanine loans). Due to this, many machinery businesses are not excessively reliant on bank finance, and bank indebtedness is rather low. Margins are relatively high, especially in niche segments. However, margins have come increasingly under pressure in recent years due to rising competition, especially from China. Payment duration in the industry is 60 days to 90 days on average. Compared to other German industries, the machinery/engineering sector’s payment behaviour and default/insolvency rate is good. The number of non-payment notifications and business failures is expected to remain low in 2018 and 2019. Given the general financial strength of Germany’s machinery businesses, our underwriting approach remains, by and large, relaxed. However, as in 2017, we remain more cautious with machinery businesses involved in the paper/print subsector, as the shift to digital has resulted in shrinking profit margins, and many companies are still restructuring to adjust their production to customers’ needs. Another segment with difficulties is textile machinery, but this subsector represents only a minor share of the German machinery industry.